Robert Thomas, Alexander Steen (pictured) and Vladimir Tarasenko all scored within a 75-second span during the first period of the Blues' win over the Lightning on Saturday night. ST. LOUIS — Home ice was anything but friendly to the Blues at the start of the season. With the playoffs approaching, they’re looking pretty comfortable in St. Louis — and they made a statement against the hottest team in the NHL. 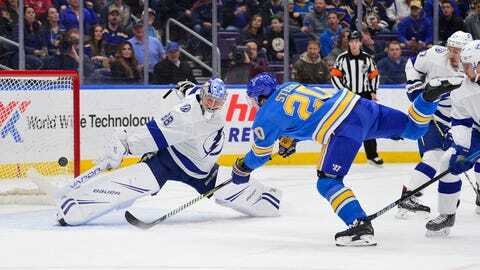 Vladimir Tarasenko had a goal and an assist, Jordan Binnington made 39 saves, and the Blues snapped Tampa Bay’s seven-game winning streak with a 4-3 victory over the league-leading Lightning on Saturday night. “It’s been a tough time on home games at the start of the year,” Tarasenko said after the Blues improved their home record to 20-15-2 and 10-2 in their last 12 at Enterprise Center. “We understand we can’t play like this at home. That’s what we were working on. Just try to make this building hard to play in again. Robert Thomas, Alexander Steen and Brayden Schenn also scored for St. Louis, which earned its third consecutive win. Binnington improved to 20-4-1. He has won his last four starts and seven of his last nine overall. Tampa Bay’s Andrei Vasilevskiy stopped 22 shots to fall to 36-9-4. He has allowed at least three goals in four of his last five starts. St. Louis jumped in front with three goals during a quick scoring flurry in the first period. Thomas put the Blues in front at 10:30 when he one-timed Vince Dunn’s rebound past Vasilevskiy for his eighth goal. Steen then got his eighth goal of the season just 37 seconds later when he buried a feed from Zach Sanford. Tarasenko made it 3-0 when he scored his team-leading 29th goal at 12:45 to give St. Louis three goals in 1:15. Tampa Bay outshot St. Louis 19-8 in the second. Alex Killorn got the Lightning on the board with a short-handed goal 27 seconds into the period. It was Killorn’s 17th on the season. Tampa Bay’s Brayden Point followed with his career-best 40th goal at 7:24. Schenn responded for St. Louis when he reached behind his skates and backhanded a rebound from Tarasenko over Vasilevskiy’s outstretched glove at 14:24. Steven Stamkos got the Lightning within one with his 39th early in the third. Stamkos appeared to tie the game with 5:43 remaining, but St. Louis won its challenge that Point was offside prior to Tampa Bay getting the puck into the offensive zone. NOTES: Blues C Tyler Bozak recorded his 400th career NHL point when he assisted on Thomas’ goal. … Binnington improved to 12-0-1 in his career versus Eastern Conference opponents. … Lightning RW Yanni Gourde served the first game of a two-game suspension for his illegal check to the head of Jordan Staal on Thursday at Carolina. … Stamkos has scored 32 goals since Nov. 29 to lead the NHL. Lightning: Host the Boston Bruins on Monday. Blues: Host the Vegas Golden Knights on Monday.